CURIOUS MINDS by No. 1 bestselling author Janet Evanovich and screenwriter Phoef Sutton is a must-read thriller for fans of the Stephanie Plum mysteries including ONE FOR THE MONEY and TRICKY TWENTY-TWO. Emerson Knight is introverted, eccentric, and has little-to-no sense of social etiquette. Good thing he's also brilliant, rich and (some people might say) handsome. Riley Moon has just graduated from Harvard. Her assertive (some people might say aggressive) spitfire attitude has helped land a dream job at Blane-Grunwald bank. At least, Riley Moon thinks it's her dream job until she is given her first assignment: babysitting Emerson Knight. 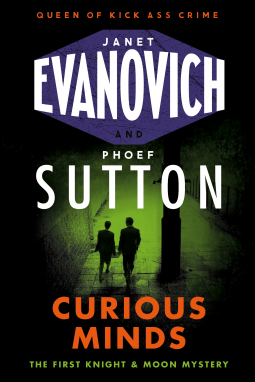 Janet Evanovich and Phoef Sutton team up to bring readers a quirky new mystery series! Curious Minds is the first release in the Knight & Moon series. Washington, D.C. transplant, Riley Moon, thinks she's working her dream job at Blane-Grunwald Bank. Life couldn't be better as she makes her way to an appointment with a very important, very rich client, the strange Emerson Knight. Emerson is as quirky as his ancestors with his huge mansion filled with secret passageways and animals not made for domestication. While Riley's job is to placate him, Emerson is determined to see his gold. Instead of opening a secure vault with all his millions worth of gold, they open a can of mystery. Riley's mentor has gone missing and Emerson is determined to find the missing Grunwald and his gold. Riley is tasked with keeping tabs on Emerson, but as truth comes to light she must decide where her allegiances lie. Riley is characterized as assertive, but she seemed more ambitious than anything. Sure she is prone to a snarky attitude, but she is continually pushed into situations when she'd rather not get involved. Towards the end of the novel she begins to push her own will more, but still not an aggressive character. Emerson, on the other hand, is the charming weirdo next door. He walks his own path and speaks his own language, but somehow manages to influence others. They are polar opposites of each other, but somehow make their partnership work. This opening novel just touches the surface of who these characters are and I can only hope that the following novels will show readers deeper into the heart of their personalities. Curious Minds is a refreshing mystery that balances technical information well with humor. This fast paced novel keeps you on the edge of your seat waiting to see where the line will be drawn between Emerson and Riley, and when the next blow will hit from outside forces. It brought to mind Joelle Charbonneau's Rebecca Robbins mysteries (Skating Around the Law, Skating Over the Line, etc) where the characters are distinct personalities that aid in creating an upbeat, hilarious read. I am more than ecstatic about the Knight & Moon series and cannot wait for the forthcoming novels!